Imagine for a moment a party, a somewhat elegant affair, populated solely by characters from the films of Billy Wilder. Over there at the piano, swirling a drink, is the doomed Walter Neff from Double Indemnity. He’s trying not to stare at the effervescent Sugar from Some Like it Hot. Fran Kubelik and C.C. Baxter from The Apartment dance closely to some postmodern jazz in another room, while Norma Desmond from Sunset Boulevard descends the main staircase to join the flinty and ambitious Chuck Tatum from Ace in the Hole. And outside, hiding in a tree on this moonlit night, yearning for a glimpse of David Larrabee, studying every movement in this full house of wild different characters, crouches the lovesick Sabrina. What an evening it would be. The biographical details of Wilder’s life are as vibrant as his film scripts. Wilder was born Samuel Wilder in 1906 in Sucha, a village in Galicia, an Austro-Hungarian province that is now part of Poland. It is well documented that his mother loved all things American and nicknamed her son ‘Billie’ after Buffalo Bill. The young Billy briefly tried to fulfill his parents’ other dreams by studying law. But he very quickly changed vocations and started working for a tabloid newspaper. Stories from this period in his life abound. Wilder was a big jazz fan as well as a dance gigolo. Both these pursuits found their way into his writing, as well as motivating his subsequent relocation to Berlin. From 1927 through to 1929, he learnt his craft by ‘ghostwriting’ on an estimated 200 scripts. His first official screenwriting credit was for The Devil’s Reporter (Ernst Laemmle, 1929), and this was followed by writing and collaboration credits on a number of early sound films. In 1933 the Nazi ascendancy caused him to flee from Germany to Paris, and finally to emigrate to America in 1934. Wilder was the last surviving member of a group of similarly exiled ‘magicians of the cinema’ that included Fritz Lang, Max Ophüls, Otto Preminger, Douglas Sirk, Edgar Ulmer, Robert Siodmak and Fred Zinnemann. Words were Wilder’s genius. And yet when he arrived in America he had to learn the nuances of his new country’s language. This led him to two long-term screenwriting collaborations that have been justifiably celebrated. The first was with Charles Brackett, a novelist, drama critic, and Harvard-educated Republican. Wilder started working with Brackett in 1936 and over the next 12 years they collaborated on many screenplays. Two of their notable writing credits were for Ernst Lubitsch’s Bluebeard’s Eighth Wife (1938) and Howard Hawks’ Ball of Fire (1941). The Wilder directed scripts they worked on included The Lost Weekend (1945) and Sunset Boulevard (1950). It was, in fact, dissatisfaction with the handling of a script that he and Brackett had written for Mitchell Lesien that led Wilder to the director’s chair. The incident most frequently retold involves a scene in Hold Back The Dawn (Mitchell Lesien, 1942) where Charles Boyer is supposed to talk to a cockroach crawling up the wall. The decision to remove this scene angered Wilder so much that he lobbied the producers to let him direct. 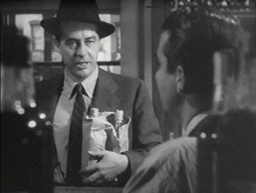 His first directorial effort was the commercially successful The Major and the Minor (1942). He followed this with 25 more films. Wilder’s second long-term writing collaboration was with Romanian-born I.A.L. Diamond, who had a degree in journalism and worked as a screenwriter for Paramount. Wilder’s collaboration with Izzy Diamond continued for 25 years resulting in films like Love in the Afternoon (1957), Some Like it Hot (1959), The Apartment (1960) and Kiss Me, Stupid (1964) amongst others. Some of the greatest films from the halcyon period of the Hollywood studio system were co-written and directed by Wilder. His work stands as an index for what was possible at that time. He experimented with film noir in Double Indemnity, melodrama in Sunset Boulevard, comic farce in Some Like it Hot, romantic comedy in Sabrina (1954) and courtroom drama in Witness for the Prosecution (1958). Yet no matter what the genre, a Wilder film looks, sounds and feels like a Wilder film. It has its own particular mood, tone and attitude, with a panorama of finely drawn, complex individuals and elaborate plots. Sometimes there is a romance, at other times a scandal, maybe even a murder, but always it is filled with Wilder’s fast and snappy dialogue. 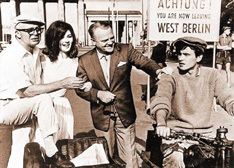 Richard Armstrong, in his excellent book, Billy Wilder, American Film Realist, (4) emphasizes Wilder’s use of real locations, real streets and actual urban settings – a practice not common at the time. Armstrong finds a poetic edge in this quest for a realistic mise en scène. He singles out sequences like the “dumping of Dietrichson’s body at the railroad tracks” in Double Indemnity “shot ‘night-for-night’ for maximum gloom” (5) as an example of poetic realism reminiscent of the work of Zola or Renoir. Wilder’s realist aesthetic, his deep shadows, gritty hard-edged streets, railway tracks, baroque houses, dramatic staircases and barren desertscapes offered startling, moody, and evocative images. While always in the service of his story, they also describe a powerful expressive film style that we now appreciate as his own. Anna Dzenis teaches cinema studies at LaTrobe University (Melbourne).